The actual cost, payable the day of the trip will be around $200.00. 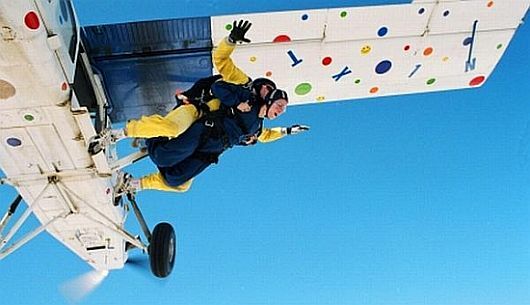 Since 1999, with only a few exceptions, Aramco Brats have gone to nearby dropzones on the Saturday of the reunion in order to make tandem parachute jumps. There is a nearby dropzone in Houston, TX ready to handle a group of us on Saturday, May 23, 2015. The estimated cost for the jump is $200.00 If we get a decent number of people interested, the price could go down. If you would like to jump, you must contact the dropzone ( www.skydivespaceland.com or call 1.800.SKYDIVE), make a reservation and leave a credit card number to hold your spot. BE SURE TO CHOOSE THE EARLIEST SLOT, AND INDICATE THAT YOU ARE PART OF THE BRAT GROUP. Please note: The dropzone is approximately one hour away from the hotel. The plan is to meet in front of the hotel and leave for the location around 8:00 am the day of the jump. If you have a car, please think about carpooling.